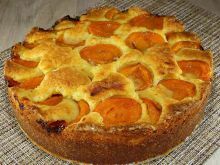 "In apricot season it would be an unforgivable sin not to bake this Juicy Cake with Apricots. And some advice - serve it with a scoop of ice cream." 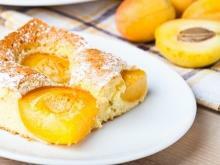 Wash the apricots, remove their pits. Leave them to drain well from the water. Beat the eggs with the sugar to foam, add the fats. Sift the flour with the baking powder and add to the cake mix, while stirring with a silicone or wooden stirrer. Aromatize with the vanilla. Divide up the resulting cake mix into 2 equal parts. Color 1 part with the yellow confectionery dye, the other with the orange one. Make the caramel by mixing together the water, sugar and butter. Stir and leave to boil on the stove until it turns the desired color. While still hot, pour it into the tray in which you'll be baking the dessert. It shouldn't be larger than 8″ (20 cm) in diameter. 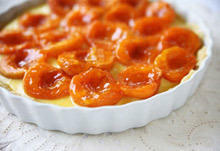 Distribute the apricots over the caramel, then on top alternate between the yellow and orange mixtures. You have to obtain a zebra stripe effect. 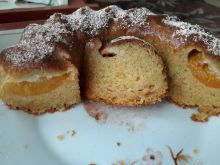 Bake the cake at 356°F (180 °C) until ready. Let it cool for about 5 min., then invert into a suitable plate.